If you like dark meat, this will be the only turkey recipe you will ever make from this point forward. Removing the thighbones, then trussing the thighs up using skewers and string, makes the dark meat the absolute best part of the entire evening. This was my second year in a row making Julia Child’s Thanksgiving. Last year I posted the turkey/stuffing combination, and this year I also wanted to include the gravy recipe; the 3 recipes go perfectly together. This post is intended to ease the juggling between the three recipes; integrating the timing of each step was the biggest challenge. By separating the turkey into three major pieces, some of the most fundamental Thanksgiving issues are solved. (1) Getting the dark meat cooked properly without overcooking the white meat. (2) getting real turkey drippings into the stuffing. As a bonus, this method cooks the turkey in about half the time, freeing up my oven to cook rolls, pies, and gravy the rest of the day. There are a few issues (discussed below), but overall this technique provides a delicious turkey. It was the best dark meat I’ve ever eaten. Chris Kimball agrees, saying “this is now my new, absolute favorite.” 4-1/2 stars. I hope you all had a delicious Thanksgiving. Start the evening before Thanksgiving, taking care of most of the prep work in about 1-1/2 hours. Cut the turkey into three major parts, (1) breast/wings, then (2) cut off each leg/thigh quarter. At first, I misread the instructions and started to cut off just the leg; not the entire leg quarter (i.e. including the thigh), but realized my mistake before I did any damage beyond the skin. The recipe only brines the breast/wings. It salts/seasons the leg quarters separately. Cutting off leg quarters, not just legs. As I mentioned above, I almost cut off just the legs in step 2. The recipe calls for me to remove the “leg quarter”. Because the wings overhanged my 12″ skillet, the juices dripped down to the oven floor and filled the house with smoke. My solution is that I recommend putting a foil-lined baking sheet below the skillet to catch the juices. If it starts to smoke you can just swap it out for new foil. Fortunately, my guests had not yet arrived. I was surprised that it took me a full hour to deconstruct and prepare the turkey, most of the time was separating the leg quarters. The back was pretty easy to remove using kitchen shears. The recipe calls for a 12-to-15-pound turkey. I bought a 19-pounder because of the number of guests, but my turkey took double the time to cook than stated in the recipe. In the end, we ate an hour late, but only because I cut the resting time down (more than I should have). While Chris Kimball tries to have the white and dark meat ready at the same time, it was not the case. The dark meat took longer, but that gave the breast an extra 10-to-15 minutes to rest. The beautiful thing about this recipe is that I was able to remove the white meat while the dark meat came up to temperature. How big of a mess? Medium/High. Start time 12 Noon. Dinner time 5 PM. Expect to spend 1-1/2 hours this evening on preparations. Mince enough fresh sage to yield 1 teaspoon and set aside until you are ready to season/truss the thigh in Step 5. Remove turkey from packaging, and remove the giblets and neck (from inside the body cavity). Reserve in a gallon-sized plastic bag (or in a large Dutch oven), which will be used tomorrow along with back and thigh bones to make the gravy. Put turkey breast-side-up on your largest cutting board. Tuck the wing back just to get it out-of-the-way. Working on one leg quarter at a time; remove the thighs/legs (the entire leg quarter in one piece). Cut through the skin around the quarters where it attaches to breast; which will allow you to better see the actual meat. From the front of the turkey (near the wings), use a boning knife to cut deeply along the bone, freeing the thigh meat; until your knife reaches the hip bone. Bend the entire leg quarter back so that the bone pops out of the hip socket, then you can continue to cut the meat away and remove entire quarter. To de-bone the thigh (just the thigh, not the drumstick), use the tip of your boning knife to cut along the length of the thigh; there is usually a thin line of fat that will show you where the bone is. Then cut around the tip of the bone and work your knife underneath the bone to expose the joint between thigh and leg. Cut through the cartilage and remove thighbone; adding bones to your bag/pot for the gravy. Repeat to remove the second leg quarter. Rub interior of each thigh with ½ teaspoon sage, ½ teaspoon salt, and ¼ teaspoon pepper. Poke 3 skewers through skin/meat to close up the thigh where your removed the thigh bone. Wrap some kitchen twine around the wooden skewers to tightly close the thigh into a nice, round piece of boneless meat. Set on a large plate, cover, and refrigerate for 6 to 12 hours until ready to cook. Trim away and discard any excess skin from around the neck. Trim away and discard any large globs of fat from the skin. To remove the back bone from the breast, flip the turkey over breast-side-down. Use kitchen shears to cut through ribs (following vertical line of fat where breast meets back) until you can’t cut anymore. You’ve reach the bone near the wing joint. Repeat on other side of backbone. Use a little force to bend the back-section away from the breast, and the shoulder joint should pop out of the socket. Cut between the bonds to separate the back from the breast, and add the back to the bag/pot for making gravy. Dissolve 3/4-cup salt into 6 quarts of cold water in a large container (I used my 8-quart stock pot; so reduced to 1/2 cup salt and 4 quarts of cold water). Submerge breast in brine, cover and refrigerate for 6 to 12 hours until ready to cook. Refrigerate reserved bones. Cut bread into 1/2-inch cubes (including the crust). Spread on-top 2 rimmed baking sheets and bake at 300-degrees from 30 to 40 minutes until it becomes dry and lightly browned. Stir a few times during baking and empty into the largest bowl you own. Set aside until Thanksgiving day. While the bread drying out is in the oven, you will have time to pre-mix your pumpkin pie filling. If you are going to make dinner rolls or bread, then mix your biga. At 8AM. If you are making dinner rolls or bread, start the dough early in the morning. The dough needs time to rise, and you need time to bake the bread without conflicting with your turkey roasting schedule. Also, I had extra rolls to serve hot around lunchtime. At 11AM: If you want your pumpkin pie shortly after dinner, this is your last free oven time to bake it. It is also possible to put it into the oven around 4:30PM (while the turkey rests); but the pie won’t be cool enough to eat until about 7:30PM. At 12 NOON: Set two over racks to the lowest and second lowest positions; pre-heat to 450-degrees. Put reserved turkey bones, onions, carrot, celery, and garlic in large roasting pan. Drizzle with 1 tablespoon vegetable oil and toss to combine. Roast, stirring occasionally, for 40 to 50 minutes until everything becomes well browned. Meanwhile, mince 2 tablespoons of fresh sage and 6 celery ribs. Add minced celery and sage to skillet, plus 1-1/2 teaspoons pepper. Continue to cook for 3 to 5 minutes until celery is softened. It is essential that the vegetables have time to dry out in the skillet or your stuffing will turn to mush. Empty vegetables into your large bowl with the bread cubes. Set aside until Step 9. AT 1PM: Transfer your gravy ingredients from the roasting pan to a large Dutch oven and set aside until Step 8. Reduce oven temperature to 425-degrees. Use paper towels to wipe out non-stick skillet. Brush surface of breast with 2 teaspoons vegetable oil and set turkey breast with the skin-side-down into skillet. Roast at 425-degrees for 35 minutes; placing a foil-lined baking sheet on the rack below turkey to catch any drippings. For the gravy, add 3-1/2 cups chicken broth, 3 cups water, 2 cups white wine and the 6 sprigs fresh thyme to the pot with the roasted turkey/vegetables from Step 6. Bring up to boil over high burner, then reduce to low and simmer for 1-1/2 hours, until it is reduced by half. At 1:30PM. Add 1 cup cranberries and 4 beaten eggs to bread mixture and toss to combine (mixture will be dry). Empty stuffing to 16″x13″ roasting pan, then use a rubber spatula to form an even 12″x10″ rectangle. The turkey will be set on-top of stuffing to protect it and prevent it from burning. Remove the breast from the oven and use paper towels to pat up the hot juices from the top of the breast. Use wads to paper towels to flip over and set over two-thirds of stuffing. Brush leg quarters with 1 teaspoon vegetable oil and arrange over the remaining stuffing. Lightly season legs and breasts with salt. Use your rubber spatula to tuck and exposed stuffing under the turkey, so that it is almost entire covered. Bake for 30 minutes at 425-degrees. At 2:30PM. Reduce oven to 350-degrees and continue cooking turkey for between 40 minutes and 2 hours. If your turkey is more than 16-to-17-pounds you will need to remove the stuffing before the turkey has fully cooked to prevent it from becoming too greasy. Put stuffing into an oven-safe pyrex casserole dish and continue baking until nicely browned. Also continue cooking turkey in the roasting pan on a v-rack. At 3:30PM to 4:30PM. Begin to check the internal temperature and remove when the breast registers 160 to 165 degrees and thighs reach 175 to 180 degrees; Remove each piece individually as each piece attains the proper temperature. Set onto a cutting board and tent with aluminum foil. In my case, parts of the skin was not crispy. I broiled the leg quarts to crisp up the skin. Rotate turkey as necessary to crisp the entire skin. Allow turkey to rest for 30 minutes before carving. While turkey rests, use a spatula to stir stuffing and scrape up any browned bits. 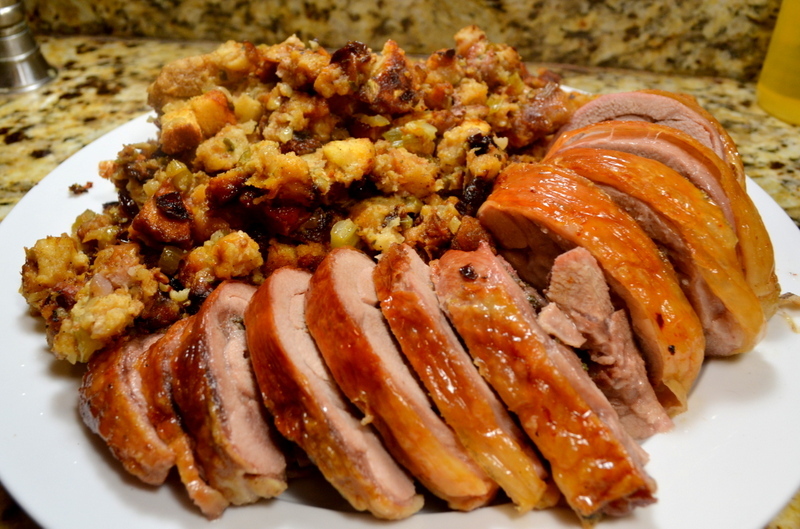 Evenly rearrange stuffing over the entire roasting pan and keep warm in the turned-off-oven. While the turkey continues to rest, finish making your gravy. Separate 1/4 cup of fat to medium saucepan. Put over medium-high burner and cook until bubbling. If you do not have 1/4 cup of reserved turkey fat, then supplement with unsalted butter. Whisk in 1/4 cup flour and cook for 2 minutes, constantly whisking, until it becomes honey-colored. Gradually whisk in hot turkey liquid and bring to boil. Reduce burner to medium-low and simmer for 5 minutes, stirring occasionally, until it has thickened. Adjust seasoning with salt and pepper to taste. Remove skewers and twine from leg quarters. Carve turkey. Before serving stuffing, adjust seasoning with salt and pepper to taste. and arrange in center of large serving platter. Serve. The breast also roasted up wonderfully moist. Here is a summary of many of Chris Kimball’s Thanksgiving options. A few of the posts are not his recipes, but I’ve nevertheless included (for my convenience). 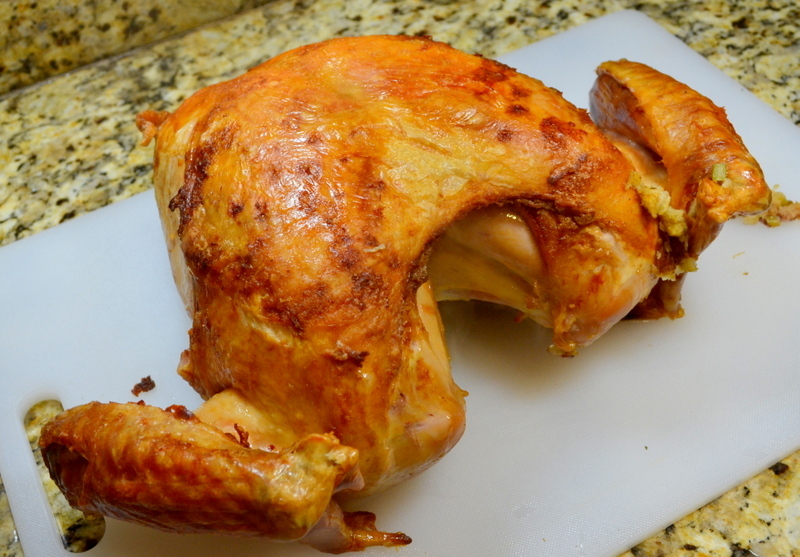 I still am afraid to risk my Thanksgiving turkey using Chris Kimball’s November 2012 recipe for Grilled Turkey; if anyone has tried, please post a comment with your results. Julia Child’s Deconstructed Turkey. 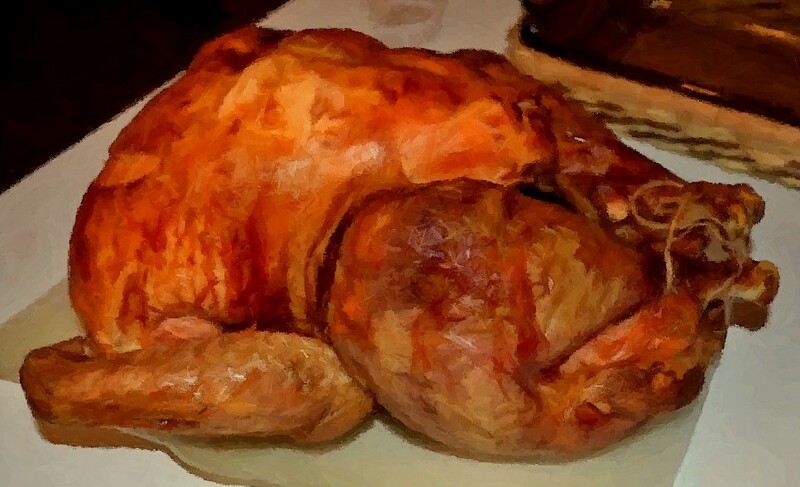 While I was resistant to departing from the tradition of roasting the turkey whole, this recipe came out fantastic last year. This recipe elevates the dark meat to become the star of the dinner. Classic stuffing with sausage. Herb Roasted Turkey, which I’ve rated 5-stars in the past. It is brined in salt water for 4 to 6 hours, then air-dried, uncovered, in the refrigerator for 8 to 24 hours to get crisp skin. The herb paste adds great flavor, but the recipe calls for a relatively hot oven (400-degrees) so I doubt this will work on my big turkey. Old Fashioned Roast Turkey. This is one of my favorite turkeys. It is draped with salt pork, which constantly bastes the turkey during baking. Also, it salts the turkey instead of a wet brine. Brined Roasted Turkey. For many years I brined my turkey to help keep the turkey from drying out. Chris Kimball’s formula is 1 cup salt per gallon cold water for 4-to 6-hour brine or 1/2 cup salt per gallon cold water for 12-to 14-hour brine. The hardest part is finding a stockpot or clean bucket large enough for the turkey. Traditional turkey gravy. This was part of Julia Child’s deconstructed turkey. Best Turkey Gravy. A classic recipe for turkey gravy. Make-Ahead Dripping-less Turkey Gravy. This recipe was developed by Cook Illustrated because it’s associated turkey recipe was cooked too hot to yield usable drippings. So if you don’t have drippings, here is the solution. Cranberry-Orange Sauce. Don’t make a standard cranberry sauce, when a little bit of triple sec and orange zest make it so much more interesting. Ocean Spray Cranberry Sauce. I made this recipe for years, which is 100 times better than canned cranberry sauce. Fluffy Mashed potatoes. Cut potatoes into 1″ chunks. Rinse, Steam for 10 minutes, Rinse again, Steam for 20 more minutes until done. It requires my Dutch Oven, but I’ve had dinner guest that raved more about these potatoes than the 5-star main course. Holiday Scalloped Potatoes. A nice 4-star alternative to standard mashed potatoes. Master Recipe for Mashed Potatoes. Requires boiling potatoes with their skins on, then peeling hot potatoes. For 15 years Chris Kimball has told us to make mashed potatoes this way. Garlic Mashed Potatoes. Peeled before cooking, then boiled in half-and-half normally added at the end of the recipe. Matt’s Pumpkin Pie. Make the filling the night before for the best flavor. This recipe is based upon King Arthur Flour recipe. My son Matt took over the pumpkin pie baking responsibilities in 2011. For him, it’s a labor of love. Libby’s Pumpkin Pie. For a long time this was my “go to” pumpkin pie recipe, until I discovered the King Arthur recipe. Chris Kimball’s Pumpkin Pie. I could never bring myself to put yams into a pumpkin pie, so have never made it. Lately, I have been busy at work and only heard the sad news about Chris Kimball’s departure from ATK today. He has always been the driving force behind the magazine (and later the TV shows), and I remember appreciating his methodology the first time I saw Cook’s Illustrated in 1994. While I guess this has been brewing for a few months (since summer), I never imagined that it would come to this. I know companies like to think that nobody is indispensable, but that opinion is often more of a hope than a reality. I guess we have to wait for a few months to find out about Chris Kimball’s “future endeavors”. I hope it is just a change in venue, and that I will be able to continue to cook his recipes for many years to come. The news is sad. I first ate Arepas 20 years ago while biking through Colombia, and loved their simple deliciousness. Years later I read about stuffed arepas (which tend to be from Venezuela). Today, after 20 years, was my first time making arepas on my own. This morning’s recipe does not come from ATK or Chris Kimball at all. It is thanks to a recent trip to Miami that I was able to buy “Pre-Cooked Corn Meal”. My technique still needs honing, but they came out delicious for a first try. Cook’s Illustrated has a description about the different types of Corn Meal here, The bottom-line is make sure that the bag says it is for arepas. Masa harina is a completely different product. The brand that I pictured is apparently the most popular. How big of a mess? Medium. Start time: 10:00 AM. End time: 11:00 PM. Soften butter in microwave for between 30 to 40 seconds. Add water to a large mixing bowl, mix in 1/2 teaspoon salt until dissolved. Slowly add in arepa flour until just comes together. Stir butter into dough and knead until evenly combined. Cover masa (dough) with plastic wrap and allow to sit for 5 minutes. Divide you dough into 8 equal parts. I used a scale and measured 3-1/2 ounces per arepa. Working with one arepa at a time, roll into a ball and gradually work into a flatten disk; fixing the edges as they break. Put between two sheets of plastic and use the curvature of your cupped hands to form perfect disks. Press a second small cutting down on top of arepa to evenly flatten to approximately 5-inches across. Use cupped hands to fix any of the edges. Set aside and put plastic wrap between the arepas as you stack them. Cook on dry griddle (without any oil whatsoever) for 12 to 15 minutes without moving until slightly browned on the first side (see photo). Flip and top with cheese (which will slowly melt). Cook the second side for between 10 to 12 minutes. Serve immediately, or keep in a warm (but turned off oven) if you need to make them in batches. I made this French pot roast for a group of my closest friends. While the original recipe called for a 4-to-5-pound roast, I bought a 6-1/2 pounder; following the general guideline of 1/2-pound per person. While the roast did stretch to feed all 13 people (a majority of whom where kids), I felt that I short-changed some of my guests. I assume I underestimated the loss and shrinkage during cooking. Delicious, but slices fell apart. My biggest complaint was the texture was too “fall-apart-tender”. The picture on the Cooks Illustrated website made me think that I would get tender beef while still retaining enough cohesiveness to get nice, clean slices. The presentation suffered a bit. Next time I will be careful to cook towards the shorter end of the cooking time; and make sure that I slice it with my sharpest knife. Fortunately, the flavor made up for the “pile of meat” presentation. The flavor of the beef and sauce was well-balanced, but the carrots were not very popular. While I thought enjoyed the carrots, it seemed most people didn’t appreciate them. Overall, 4-stars. Start time: 11:30 AM. End time: 5 PM. 4 ounces thick cut bacon. Pull apart the roast into 2 pieces and trim away fat. Season meat with 2 teaspoons kosher salt. Set on wire rack over a rimmed baking sheet, and allow to stand for 1 hour at room temperature. With 15 minutes to go, set a large sauce pan over medium-high burner and simmer the bottle of wine until it has reduced to 2 cups. Also tie your parsley sprigs and thyme sprigs together into a bundle using kitchen twine. Use paper towels to dry the beef and generously sprinkle with 1-1/2 teaspoons of ground pepper. Use 3 to 4 pieces of kitchen twine around each roast to prevent it from falling apart during the long cooking time. Set a rack to the lower-middle of your oven and pre-heat to 300-degrees. Cut bacon crosswise into 1/4″-wide match-sticks. Set a large Dutch oven over medium-high burner and cook bacon for 7 to 8 minutes until crispy. Remove bacon to a plate lines with paper-towels and reserve until Step 7. Empty and discard all but 2 tablespoons of bacon fat; and return pot to medium-high burner. When the fat begins to smoke, brown the roasts on all four sides for a total of 8 to 10 minutes. While the beef browns, finely chop your onion. Remove beef to large plate and set aside. Turn down burner to medium, add chopped onions to pot and allow to soften for 2 to 4 minutes; using the moisture the onions give off to begin to de-glaze the pot. Add mined garlic, flour, and crispy bacon from Step 5. After 30 seconds add the reduced wine, 2 cups beef broth, the herb bundle and bay leaves. Use a wooden spoon to scrape up the brown bits stuck to the bottom of the pan. Add browned roasts (and any accumulated juices) back to the pot. Bring up to a simmer over high burner, then put a large piece of aluminum foil over the pot and cover with lid. Bake for 2-1/2 to 3 hours until a fork easily slips into the meat. Use tongs to turn beef every hour, and add carrots to the pot after 2 hours. About the time you add the carrots, Put a large skillet over medium-high burner. Add pearl onions, butter, sugar, and 1/2 cup water, Bring up to a boil, then cover and reduce burner to medium. Cook for 6 to 8 minutes until the onions are tender, then uncover and increase burner to medium-high and cook for 3 to 4 minutes until the liquid completely evaporates. While the pearl onions cook, wipe your mushrooms clean, trim away and discard the stems. Cut small mushrooms in half, and large mushrooms into quarters. After liquid evaporates and mushrooms and 1/4 teaspoon table salt. Continue cooking for 8 to 12 minutes until everything becomes browned and glazed. As the beef is ready to come out of the pot (in step 13) use a little of the braising liquid to de-glaze the skillet. Separately, place 1/4 cup cold water in small bowl and sprinkle gelatin on top to allow it to soften. Remove beef to cutting board, tent with aluminum foil. Allow braising liquid to settle for 5 minutes, then skim and fat off the surface. Fish out and discard herb bundle and bay leaves. Add in onion-mushroom and bring up to a simmer over medium-high burner. Reduce for 20 to 30 minutes until it measures 3-1/4 cups. Taste sauce and adjust salt and pepper according to your taste. Stir in softened gelatin. Remove and discard kitchen twice. Carve into 1/2″-thick slices with a sharp, non-serrated knife. Serve beef slices with vegetables along side, sprinkled with minced parsley and sauce poured on-top of meat. I served this as a side-dish to a wonderful French meal (see Boeuf à la mode, Onion Soup). While the asparagus was naturally tasty, the sauce mostly fell off and left plain asparagus. As I think the recipe needs to be judged on whether or not it enhances it’s deliciousness, as written, I can give the recipe only 3-stars. However, you will not be unhappy with the end results.Who doesn’t love broiled asparagus? Over the years Chris Kimball has flip-flopped on calling for thick versus thin asparagus. This recipe dating from 2001 calls for thin asparagus. Later in 2012, Chris Kimball said that thick asparagus are better for the broiler. Way back in 1993 she said that steamed are better than boiled. In any case, I followed the recipe as it was written and used thin asparagus. You should always snap off the tough ends when cooking asparagus. Chris Kimball says to hold the asparagus halfway down the stalk; then with the other hand, holding the cut end between the thumb and index finger about 1″ from the bottom; bend the stalk until it snaps. Each stalk will break in a different place depending upon how tough the stalk is. How big of a mess? Low. Started: 5:40 pm Ready: 6:00 pm. Adjust oven rack so that it is 4 to 5″ from broiler element. Pre-heat broiler. Line a heavy rimmed baking sheet with aluminum foil. Lay out the asparagus and drizzle with 1 tablespoon olive oil, sprinkle with salt and pepper. Toss until evenly coated and lay out into a single layer. Broil for 8 to 10 minutes until lightly browned; shaking the pan halfway through cooking so that they cook evenly. Allow to cool for 5 minutes and arrange on a serving platter. While the asparagus cools, add shallot, lemon juice and zest, thyme, mustard, and olive oil in small bowl. Whisk and season to taste with salt and pepper. Drizzle over asparagus and serve immediately. You are currently browsing the My Year Cooking with Chris Kimball blog archives for November, 2015. 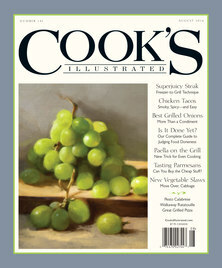 To make recipes from Cook's Illustrated, Cooks Country, and America's Test Kitchen (ATK). Working through each issue of the magazine and episode of the shows.